A conference on teacher-powered schools sent out a request for presentation proposals. In response, Alysia and I put together a proposal in which we share some of the problems we encountered with Chrysalis in order to help others avoid them. One point we wanted to make is that a top-down flow of power is so deeply embedded in the public school system that it has created, over time, a vast web of assumptions that have become unconscious. To make this conscious for the attendees of our presentation, we were thinking of specific decisions that arise within the school year. Who has the power to make that decision? As we were working on that list, an interesting thing happened at Chrysalis. One of our teachers bought some paint and painted her classroom a color she liked. Other teachers wished they could do that so Irene, our new administrator, obtained a small grant of interior paint in various colors that teachers could use if they wanted to paint their classroom at the end of the school year. I would never have spent my administrative time doing that because (1) it didn’t seem worth the time to pursue a grant worth about 50 cans of paint and, most importantly (2) I would never consider proposing something that would require teachers to do something unpaid above and beyond during their summer vacation. So I would never have even thought of that possibility. But Irene did and the result was amazing. It turned into a joyous bonding time. On the last day of classes, kids helped their teacher move everything away from the walls into the middle of the room. The week after graduation, almost all the teachers were at school, helping paint one another’s rooms and helping each other with color schemes and space design. And now, each classroom is a different color. One walks from one unique room into another. Each classroom is that teacher’s classroom. That is the heart of it; that it declares that this classroom is that teacher’s. In most schools, this would never happen because principals have and use their power to move teachers around, from grade to grade, from room to room. So a classroom is never yours. It’s always on loan from the system. “Who decides the color of your classroom?” will be one of the questions we ask at our presentation to help make conscious some of the assumptions that develop within a top-down power structure. Alysia and I spent a wonderful month on summer vacation visiting the Grand Tetons, Yellowstone, and Glacier national parks. When I was in my twenties, I prided myself on getting far away from national park crowds as quickly as possible, spending most of my time out in the backcountry. But this time, forty years later, we had reservations in the official park campgrounds and spent most of our days on the shorter dayhikes. I was delighted at how often I was uplifted by the human interactions. The national parks (especially those three) have great power to lift up the human spirit so people from all around the world are having the fundamentally human experience of having one’s spirit uplifted – while in the presence of many others who are also having their spirits uplifted. In the midst of that, smile a lot. We take care of one another. We delight in being helpful. We are more open in sharing our inner state and so are more sensitive to the inner states of others so there is a warmer feel to social interactions. We met many teachers because it is Summer Vacation. We would talk shop together. Had a deep conversation with a young couple leaving a known teaching job in search of a kind of teaching that would better satisfy his soul. There were throngs of Chinese in Yellowstone. We had a long conversation with a couple from China about how in China, you pretend to be happy and just concentrate on doing your best in the immediate world around you and you don’t get involved in or talk about politics. What happens when all these Chinese tourists go back home and talk about experiencing a different way it can be? We talked with a doctorate student searching for what correlates with the high density of mussels in North Carolina streams around millraces. I had an delightfully amazing math lesson with Charlie, a seven-year old, who loved math. We did a spontaneous lesson, me following his light but leading him always out along his edge. We started with how many fingers would there be counting his mother, his younger brother, and himself. He got that: 30. That led to how many fingers between all of us (mother, father, brother, himself, me, and Alysia who was engaged in a long conversation with the mom about how to homeschool math). He calculated that as sixty fingers between the six of us. But when I added toes, we stepped over the edge into the exciting “not sure”. He knew the answer should have 12 in it but in a way that is more than a hundred. When we worked our way slowly up to 120, his eyes lit up and we were off and running with place value and names for big numbers and number of needles in a cluster on different pine trees and all sorts of fun stuff. Throughout I was telling him that the important thing was not just getting the right answer but understanding why that was the right answer. I spent a lot of our vacation time working on Roaming, trying to outline gnarly sections that have deflected me time and time again. In Roaming, I am trying to interweave two themes. The main one is describing a way of seeing the world that I believe our culture needs to practice (taking Shifting further). This way of seeing has developed through many experiences such as my ranger experiences, teaching, and rain walks. I believe this way of seeing needs to be founded on the actual experiences that taught me; that way the ideas are specific and alive, not generalized concepts. The second theme is how my life has been a dance of feedback with the world that has drawn me into life-steering experiences. The world can be trusted for guidance. “Beauty is not on the map…. Seek and ye shall find.” The book would be an autobiography except the editorial focus is on lessons learned, not chronological completeness. The sections that frustrate me are those that are so conceptual that I bog down in lectures. On this vacation, I was trying to break these concepts down into their components and trace them back to their origin stories. How did they come to live within my life? I spent one day camped by a lake trying to work out how reading about systems thinking as a park ranger in Denali changed my relationship with the natural world around me. One assumption of systems thinking is that every system is composed of subsystems and every system is actually a subsystem within an even greater system. This leads to seeing structure as the boundaries of sub-systems that fit together to form a larger working system. At the end of a productive afternoon of writing, we went kayaking. I tried putting myself into the mind of a reader. If I tried consciously looking at the world in terms of structures, what would I see? I came upon a stream flowing into the lake. In the clear water, I could see the delta that had formed as stream-tumbled rock dropped out of suspension in the still lake waters. I paddled around the delta, observing its structure. The easiest structure to notice was with the water. A series of small standing waves extended about twenty feet into the lake as the narrow stream’s current deaccelerated into the slack water. Velocity was being rubbed off on either side, powering large eddies that slowly circled around both sides of the current. The standing waves diminished downstream as the current faded into the slow eddies. Beneath the surface lay the delta, comprised of three different structures. Directly beneath the current stretched a narrow lane of fist-sized, lightcolored rocks that extended almost to the furthest reach of the delta. These larger rocks are the ones that can hold their place despite the water’s kinetic energy streaming past them. Bordering this lane on either side was a foot-wide pavement of darker, smaller rocks. This structure lay beneath where the sides of the current were rubbing off its kinetic energy into the eddies. Some of the current was flowing off to the sides, sufficient to push along smaller rocks but this sideflow was weaker and short-lived so that this structure of smaller rocks faded away after a short distance. bottom. Near the shore, this might only be a foot but out at the outermost edges of the delta, this steep slope of sand dropped five feet to the lake bottom. I knew these steep slopes were at the angle of repose because I played with them. If I took my paddle and disturbed the sand four feet below the surface, the sand immediately upslope would slump into the disturbance, creating an opening for the sand further up to slump downward in a progressively upward cascade of downward slumping until the slumping reached the top edge of the delta. 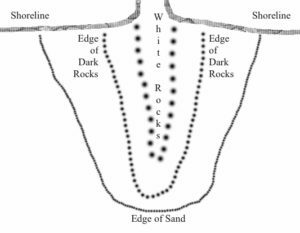 That upper perimeter of the delta represented the point where the current had slackened almost to zero, with only enough energy to barely push sand grains over the edge. Over that edge, they dropped into slack water, dropping and sliding so slowly down the delta slope that they could come to rest on any slope angled at less than the angle of repose, building it up, steepening it closer to the angle of repose. If the entire slope was already at the angle of repose, then the sand grain drifted all the way to the bottom of the slope, coming to form the bottom-most grain of the next grain-sized layer of sand to build up as the delta slowly extended further into the lake. There was a sense of dynamic balance within this shape. In the main force of the current, only larger rocks could settle out. Smaller stuff would be pushed further. The next layer to settle out was the smaller stones. They lay just beyond the larger stones. The layer of smaller stones was narrower off to the side because any flow leaving the momentum of the straight-ahead current quickly slowed, dropping any small rocks it was carrying along. The momentum in the main current could carry small rocks straight ahead several feet further before the rocks tumbled to a rest and the sand dropped out just beyond the third structure. One of the beauties of the delta was its smooth transitions throughout, thanks to the same dynamics I have seen in leaf jam dams. If the current spreads new sand out over the top of part of the delta, that raises the surface there enough to shunt the current off to the sides. Less sand will be carried that way. It will be carried onto some other part of the delta surface that is a bit lower, raising it until it, in turn, shunts the flow to the next area. Because of this dynamic, the delta surface is uniformly smooth to within a few sand grains thickness. Smooth, smooth, out to the edge and then down at the steepest angle possible. Paying attention to the structure of the entering current and the delta beneath it reveals the relationship between the rock sizes within the delta and their location within the current. The dynamics of the current shape the delta. But on the other hand, I can also see that as the delta slowly extends out into the lake, the delta will allow the current to flow further before it is slowed by the still lake water. So the delta also shapes the current. 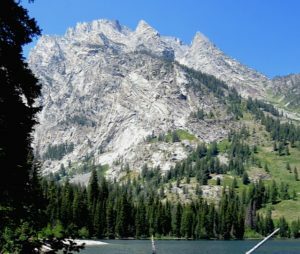 Similarly, when I looked at the mountain above the lake, I noticed that the forest covered its lower flanks but as the mountain steepened on its mid7 flanks, the forest broke up into “islands” of green upon a grey bedrock “sea”. The larger the island, the more trees it had. Also, the larger the island, the gentler that particular part of the slope was. The higher on the mountain, the smaller the islands tended to be. Then I started to notice how the location of the green islands fits with the angled bedding and dikes of the metamorphic rocks making up the mountain. Some bedding held the green islands better than other beddings. On the upper flanks, the tree islands are replaced with patches of snow. Their distribution is different. They lurk in the “shaded during the day” places which highlights subtle differences in the directions the craggy mountain slope faces. The geologic structure shapes the biological structures. But the biological structures also act as sponges or nets that catch rocks tumbling down from higher up. The green islands can grow and explore their edges so the biological structures alter the surfaces of the mountains in a never-ending dance. Assume that every system is also a subsystem within a larger system. I look out across the lake at distant mountains and notice how clouds float above them. Clouds are a structure lying above the structure of the mountains. Two systems, “mountain clouds” and “cloud mountains” are parts of a greater system that shape the mountain biome and the continent’s hydrology as rivers flow from the forested mountains. When I see the world this way, I welcome in the awareness that I and everything I identify with is a subsystem within a larger system and I feel blessed to be part of this vast oneness. And then I remember the wonderful quote by Henri Bortoft (that Dr. David Seamon gifted me) and that I’ve quoted in Cairns before. As a practiced way of observing the world, this “moment” of discovery can be stretched into extended periods of awareness. (That’s what hooks scientists.) However, Bortoft is eloquently right when he says that “it cannot be ‘translated’ adequately into the verbal language of secondhand description.” As he states, when one tries “abstracting from different instances something that is common to them”, one ends up with “an abstracted unity with the dead quality of a lowest common factor.” In my case with the mountains and delta, the abstracted unity is “It’s all one” or “Everything is connected” – which is true. It’s so true that this has been expressed a hundred ways by so many people that, as words, it becomes a platitude that can evaporate in the economic heat of the day instead of soaking in to nourish a wiser culture. That is why I strive to write descriptions of ways to look at the world that lead to experiencing these moments directly. Twenty years ago, in the midst of a meditation retreat, a wonderful idea came to me on how to engineer a solution to a cutbank along the streambed that flows across “our land”. (The streambed is dry except in the rainy season. It “floods” during heavy rains.) So I built it. I drove concrete stakes into the upstream side of the cutbank and then securely fastened welded wire fencing to it so that the fencing stretched along the face of the cutbank. That way, I realized, some of the erosive energy that formerly rubbed against the cutbank itself would get caught up in the wire matrix of the fencing a few inches away from the cutbank. It seemed to work after the first storm; there were leaves and twigs entangled in portions of the fencing so things were accumulating there rather than being washed away. I went down after the next storm to discover a mess. I had thought only water and leaves and such would flow by the fencing. I had forgotten about logs. One had hooked onto the fencing and, with the full power of the flood behind it, ripped my structure off the bank and tangled the fencing into a god-awful tangle just past the turn where it was now half-buried in the streambed gravel. Over the course of the next month, the piled-up mess deflected flood currents strongly against the base of a beautiful oak, collapsing it into the stream which then pushed the current against another part of the bank which undercut and collapsed another lovely oak tree into the streambed. By now, the fencing was a complete mess of wire and gravel within the mass of two fallen trees. I came to think of it as my hubris fence. Instead of being content to go high in the drainage where I could find a place within my power to shift relative balances, I had over-estimated my powers and the world slammed me back down with the loss of two beautiful trees and a mess of trees and fencing that I have had to walk by for the last twenty years. I have accepted its presence all this time, partly because it is a spiritual reminder but mainly because there is no way I can extricate the tangled fencing buried within the sands. But yesterday, I had a new thought about my hubris fence. If I cut out and removed whatever part of the fencing was sticking up out of the streambed, then the next flood might uncover another little section that I could cut free. Maybe, gradually, piece by piece, over the next twenty years, I might be able to remove my mistake from the streambed. So yesterday I started and cut off all that I could.